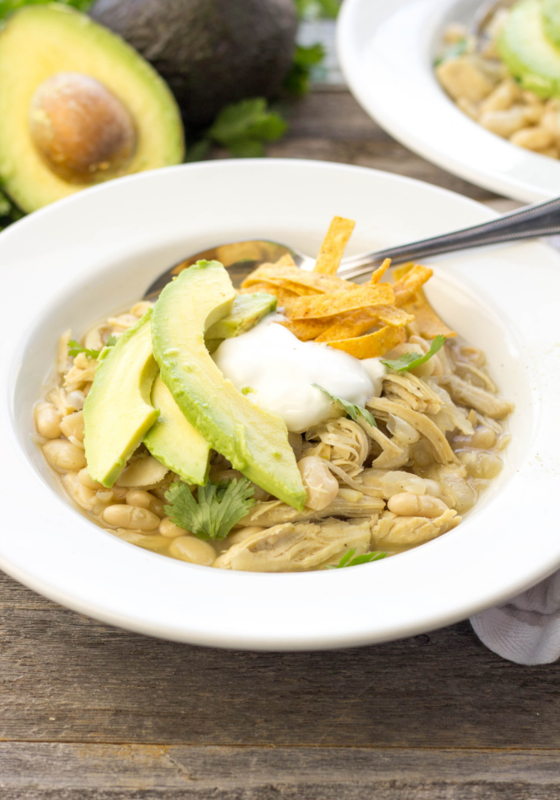 Crock-pot White Chicken Chili is made with chicken breast, Northern beans, yellow onion, chicken broth, salsa verde and seasonings. Top with sour cream , fresh avocado slices, tortilla strips and cilantro. Crock-pot White Chicken Chili is one of those really simple dump and go meals. Just make sure to soak the beans in a big bowl of water the night before so you can toss everything together in the morning. Cook on low all day, shred the chicken and serve with delicious toppings. 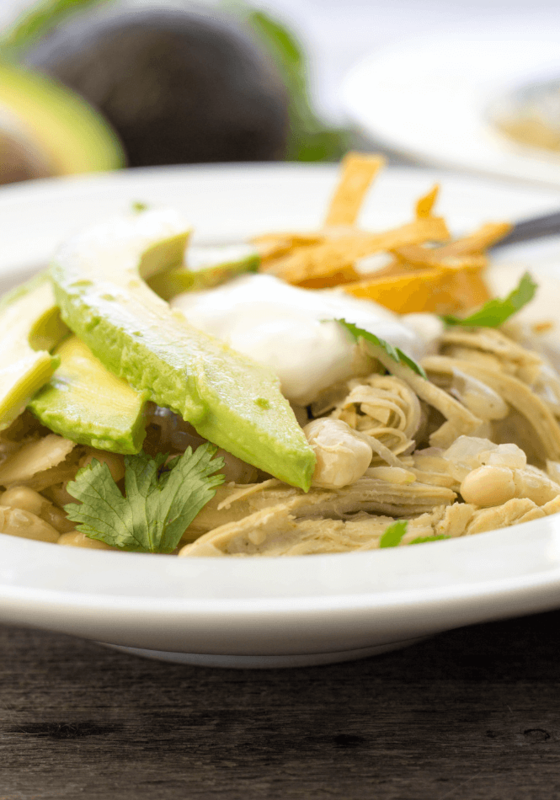 We enjoy cilantro, fresh avocado, sour cream and crunchy tortilla strips. If you want to thicken up the broth a bit, take your spoon or ladle and squish some of the cooked beans against the side of the crock-pot before serving! From time to time we also add extras in this soup. Put in whatever extras you have around the house like corn, carrots, celery, or herbs for more flavor and textures! 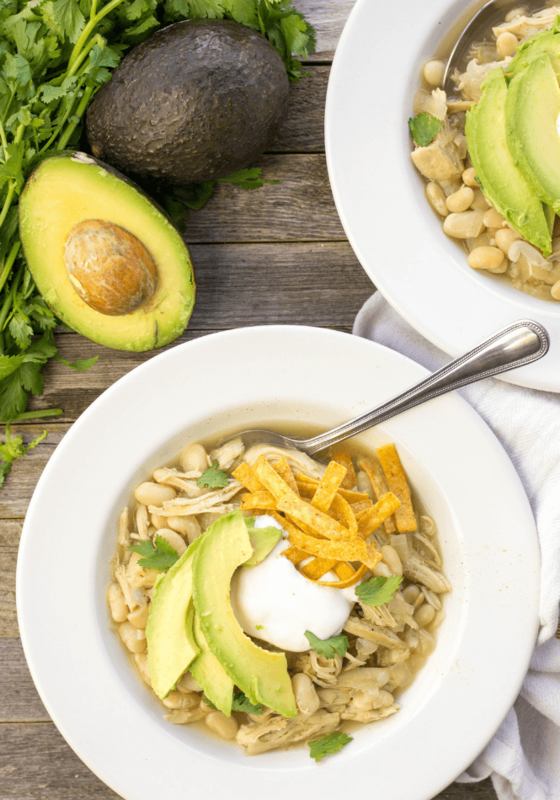 White Chicken Chili is made with chicken breast, Northern beans, yellow onion, chicken broth, salsa verde and seasonings. 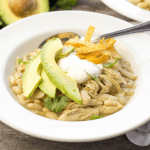 Top with sour cream , fresh avocado slices, tortilla strips and cilantro. Place drained beans, chicken, salsa verde, and chicken broth into crock-pot. Dice the onion and mince the garlic cloves. Place into crock-pot along with 2 teaspoons cumin, 1 teaspoon pepper and a bay leaf. I also like to add a sprig of rosemary when I have it on hand. Remove the rosemary sprig and bay leaf. Remove the chicken breasts, shred, and return to crock-pot. Mash some of the beans on the side the crock-pot with your ladle or spoon to thicken up the soup to your preference. Serve with your favorite toppings like sour cream, fresh cilantro and tortilla strips. 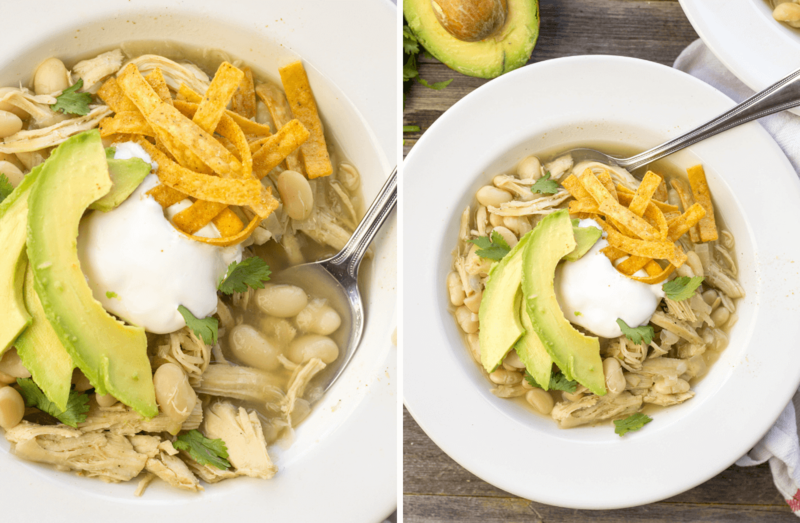 What topping will you put on your Crock-pot White Chicken Chili? White chicken chili is one of my absolute favorite winter meals! So good, easy and filling on a super cold day! This looks like an awesome soup for these chilly months. 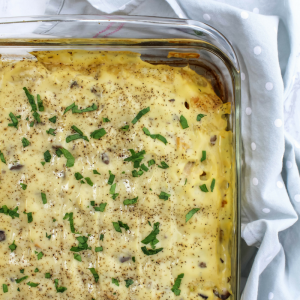 I love that you can make it int he slow cooker as well to keep things nice and easy! This chili looks like a great recipe for a Super Bowl Party! Easy and tasty for sure! I love white northern beans! Thats a good idea! I like some hearty dishes for football season. Oh man this looks delish! I wish I had a big bowl right now. Pinning for later! Perfect for this weather Holly! Oh it looks wonderful!! I love anything with cumin! It really adds a nice flavor.